Direct solar energy storage; more developments in wooden chips; leaves inspire micro-supercapacitors. Storing solar energy as hydrogen is a promising way for developing comprehensive renewable energy systems. To accomplish this, traditional solar panels can be used to generate an electrical current that splits water molecules into oxygen and hydrogen, the latter being considered a form of solar fuel. However, the cost of producing efficient solar panels makes water-splitting technologies too expensive to commercialize. EPFL scientists developed an unconventional method to fabricate high-quality, efficient solar panels for direct solar hydrogen production with low cost. The researchers focused on one of the best 2-D materials for solar water splitting, tungsten diselenide. Past studies have shown that this material has a great efficiency for converting solar energy directly into hydrogen fuel while also being highly stable. To make the thin films, the researchers injected tungsten diselenide ink at the boundary between two liquids that do not mix. Exploiting this oil-and-water effect, they used the interface of the two liquids as a “rolling pin” to form an even and high-quality thin film with minimal clumping and restacking. The liquids were then carefully removed and the thin film was transferred to a flexible plastic support, which is much less expensive than a traditional solar panel. The thin film was tested and found to be superior in efficiency to films made with the same material but using other comparable methods. At this proof-of-concept stage, the direct solar-to-hydrogen conversion efficiency was around 1%, an improvement over thin films prepared by other methods, and with potential for higher efficiencies in the future. 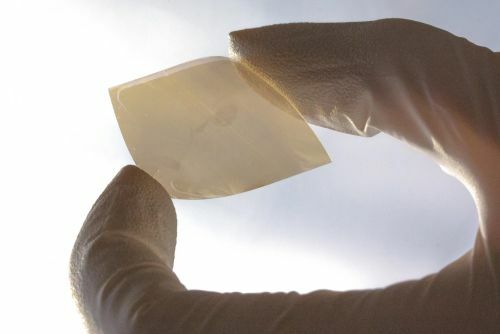 Joining the search for compostable chips, researchers from the University of Wisconsin-Madison demonstrated the feasibility of making microwave biodegradable thin-film transistors from cellulose nanofibrillated fiber, a transparent, flexible biodegradable substrate made from wood. 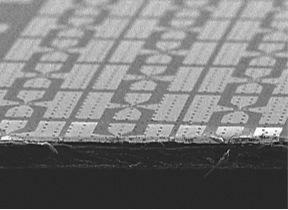 To create high-performance devices, Ma’s team employed silicon nanomembranes as the active material in the transistor – pieces of ultra-thin films peeled from the bulk crystal and then transferred and glued onto the cellulose nanofibrill substrate to create a flexible, biodegradable and transparent silicon transistor. But to make portable electronics, the biodegradable transistor needed to be able to operate at microwave frequencies. The researchers conducted a series of experiments to study the device’s functional performance, which showed the biodegradable transistor has superior microwave-frequency operation capabilities comparable to existing semiconductor transistors. Next, the team plans to develop more complicated circuit system based on the biodegradable transistors. Researchers from the Institute for Basic Science and Sungkyunkwan University in South Korea devised a new technique for creating a solid-state micro-supercapacitor (MCS) modeled on natural vein-textured leaves in order to take advantage of the natural transport pathways which enable efficient ion diffusion parallel to the graphene planes found within them.